Krista and Neal’s St. Pete Beach wedding featured a vintage and vibrant, tropical inspired color palette, enhanced by the selection of natural bright blooms. Keeping with their tropical theme, the bride turned to St. Pete wedding florist Wonderland Floral Art to create an array of natural bouquets and centerpieces that would offer a pop of color for their outdoor wedding. The downtown Tampa couple didn’t have to search far for a St. Pete wedding photographer. 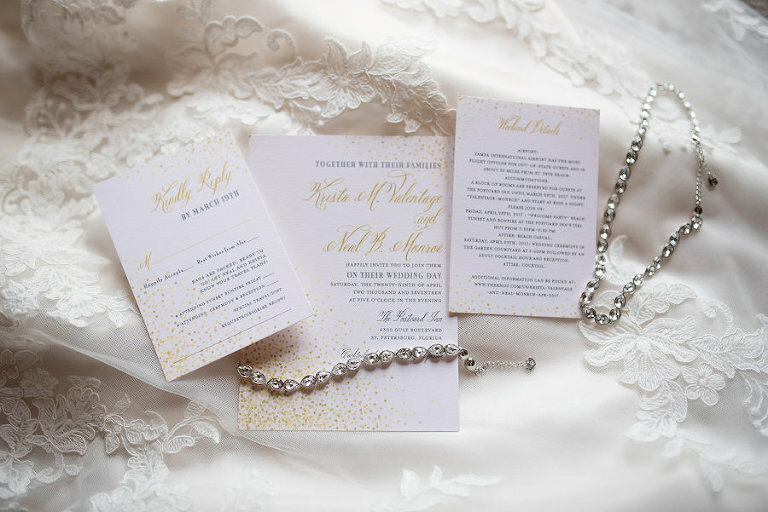 Having seen Kristen Marie Photography capture two of their friends’ weddings, Krista and Neal knew that she would be one of their first vendors to book. Honing in on the advice from other brides, the bride knew that she had to hire a St. Pete wedding videographer to capture her special day. Looking back, Krista had a few memorable moments that stuck out in her mind from her wedding day. “Our ceremony was original and fun! My father’s speech, which he spent the week prior saying he wasn’t comfortable doing, was beautiful and very special. My sister singing one of our favorite childhood songs with the band later in the evening was also a favorite,” Krista reminisced. The one piece of advice brides told me was their one regret was not hiring a videographer. When we met Bonnie of Bonnie Newman Creative and saw her creative style, we immediately put down a deposit because we knew we didn’t want to have the same regrets. I loved that Bonnie offered a shorter video of the highlights, which was really all we wanted. I truly believe that she captures the excitement of the day, as well as the love shared between the couples she films who are surrounded by their friends and family. I had considered the floral classes that Wonderland Floral Art offers to create our floral arrangements, and I love the flexibility that they offered through the planning process. When we met to discuss my vision, the owner Cassie was honest, approachable and gave realistic options that were within our budget. We wanted to complement the natural setting of our venue and plan for an outdoor reception. Cassie gave knowledgeable recommendations, and the end product was absolutely stunning. We are still getting compliments on her work! We had a cruise planned with my family over Thanksgiving, and Neal made special plans for us the night before my family came to town. I had a feeling he was proposing, because he was so nervous and acting strange, so I knew something was up! We were on our friend’s catamaran for a sunset cruise in Tampa Bay, when they suggested we go check out the front of the boat for the sunset and that’s where the magic happened. It was very sweet and private, but we were able to celebrate with my family on our vacation that followed. Kristen Marie Photography photographed two of our friends’ weddings, and we liked her style. She was one of the first vendors we booked. Our pictures turned out beautiful and she was very efficient with our time on our wedding day. I recall standing up in weddings where it felt like we took photos for hours, and I didn’t want to miss out on the time we had to spend with our dearest friends and family. 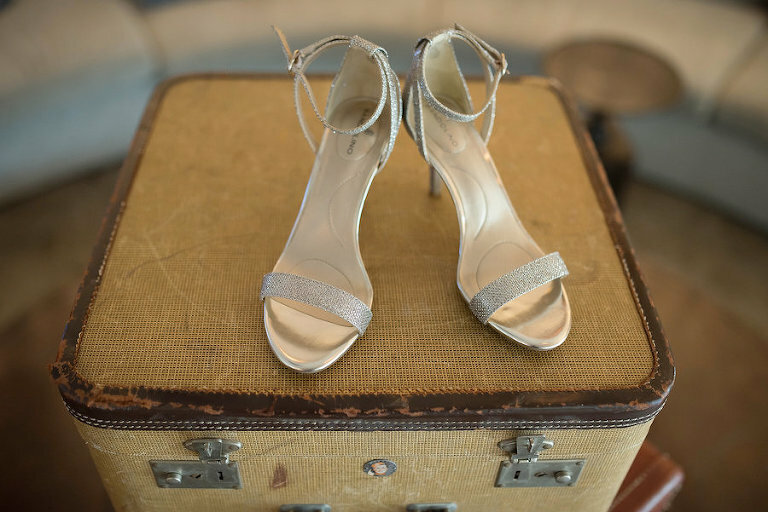 I originally envisioned a garden theme, and I loved the blushes and greens, however I started to see that everywhere and felt the need to embrace the vintage, surfer-chic ambiance at our venue. I began to look at vintage Hawaiian themes for new inspiration. I fell in love with the mini-pineapples and was excited to include them throughout the wedding details, including a gold pineapple wax seal on the invites. 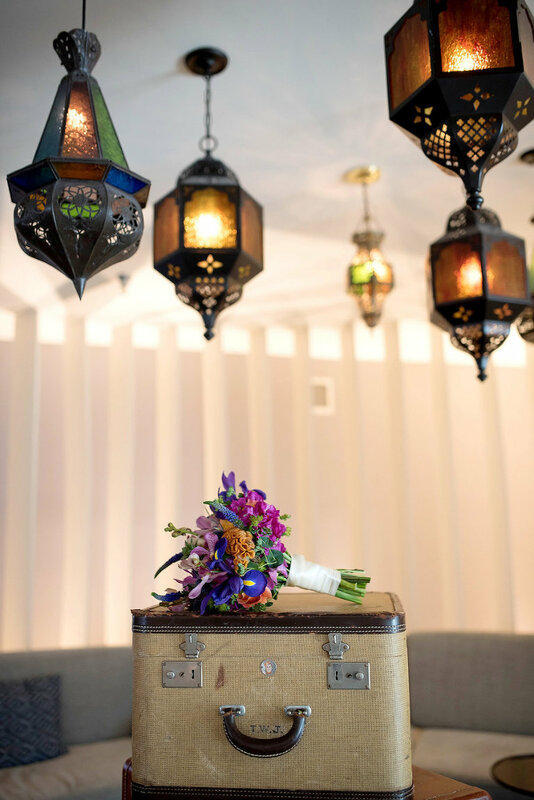 Tropical purples, oranges and pinks to complement the natural beauty at our venue. Do what you want, it’s your day. We didn’t have a wedding party, but we were able to incorporate our close friends in many ways which was just as special and less complicated. Have fun with the planning and let friends and family help. They wouldn’t be offering if they didn’t want to!